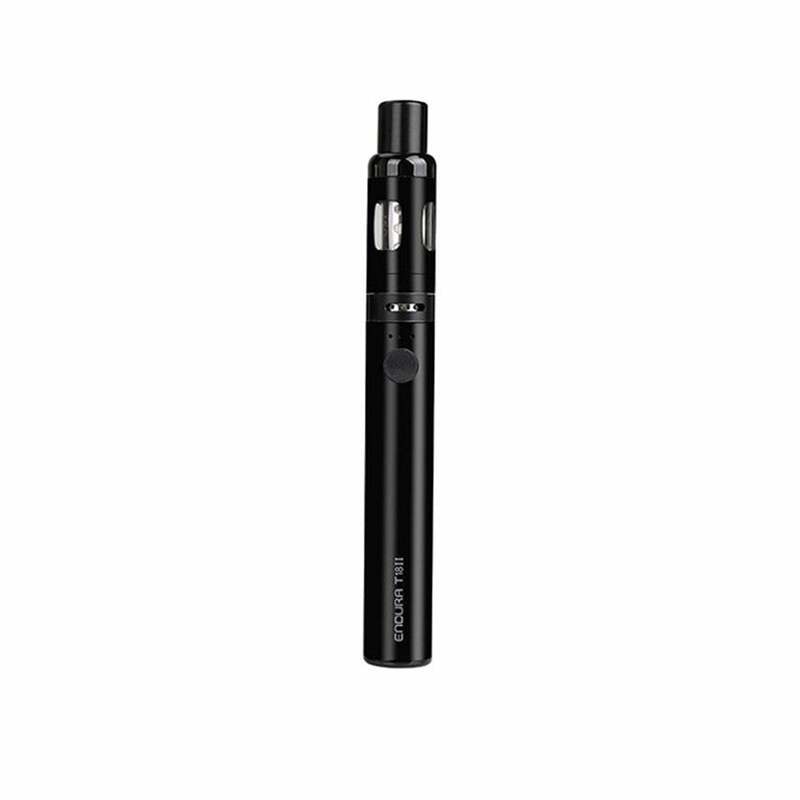 The Endura T18 II by Innokin is the perfect vape pen starter kit for vapers who want a pen with serious battery power behind it. The Endura T18 II has a powerful 1300mAh built-in battery that can be charged via the included micro-USB cable. There are four airflow options and three power presets, 10.5W, 12W, and 13.5W, allowing you to customize your vaping experience. The included Prism T18 Tank can hold up to 2.5ml of your favorite vape juice, and its coils are made of organic cotton with a resistance of 1.5ohm. The magnetic top cap cover keeps the mouthpiece sanitary, and it magnetically attaches to the bottom while you vape. Click the fire button three times to turn the device on and off, both battery levels and wattage setting is displayed with 3 LED lights above the fire button. The included Endura T18 Coils work best with a vape juice VG/PG ratio of 50/50 and with stronger levels of nicotine. I am really enjoying this T18 2 vape pen. It's wonderful. Great flavor with adjustable temp and air flow. No spitting or leaking what so ever. It's a breeze to top fill and super easy to change the coil, which lasts me quite a long time. I highly recommend it to anyone looking to simplify their daily vaping. Best I have found for this style of vape pen, but still not perfect. Pros: Great flavor if you let it seep at least 30 minutes. Don't get impatient because it will only take one burnt hit to ruin the coin. Charge lasts most of the day, and I puff on it all day. Anyone that doesn't will stay charged much longer. Easy to fill and change coils. Easy to change between 3 settings to control vapor production. No spit back, and only a little gurgling when it has been sitting unused. Cons: Takes hours to charge, I have 4 so it is not a big issue for me, but if you only keep 1, expect a wait time. Coils do not last long. I only get 3 days out of them, but again, I puff all day long. As comparison, coils in my other devices usually last a week or more. Minimal leakage, usually only when the coil need to be replaced.